Coming up this week we are excited to have author and Grandmaster Dan Medina. Grandmaster Dan Medina was first introduced to martial arts with a combination of Judo and the Navy Seal Quick-Kill method. He joined the Black Masters Sphinx Karate Clan of the Philippines, and discovered the art of Arnis 63 Generals. In 1978, he joined Philippine Martial Arts Studio and studied with Shihan Raynaldo Gingco a Kyokushin and Kuntaw Instructor. In 1980, he became a student of Grandmaster Narrie Babao learning the arts of Arnis Batangas and Kuntao. 1984 to 86, Medina, mastered the Ocho system and Modern Arnis Ernesto Presas Style under the tutelage of Philip Pabalinas. In 1986, Dan Medina moved to Hawaii and became a disciple of Great Grandmaster Braulio T. Pedoy and his son, Batikan Eduardo J. Pedoy. Currently, Dan is the founder and Grand Master of Majapai Derobio and Rajah (6th Degree Red & White belt), Florida V.P. for Sphinx Karate & Arnis 63 Generals. With a 3rd Dan in Kobudo and has received a Doctorate for his contributions to the Martial Arts, he also holds an honorary Black Belt for his contributions to the art of Kajukembo by Grand Master Sam Allred . From 2001to present G.M. Medina has been inducted into the International Karate and Kickboxing Hall of Fame, Eastern USA International Blackbelt Hall of Fame, Action Martial Arts Magazine Hall of Honors and World Head of Family Sokeship Council hall of Fame. In 2014 Grandmaster Dan Medina has been nominated as a Legendary Figure in the Martial Arts by W.H.F.S.C as well as a Nomination to the Masters Hall of Fame. 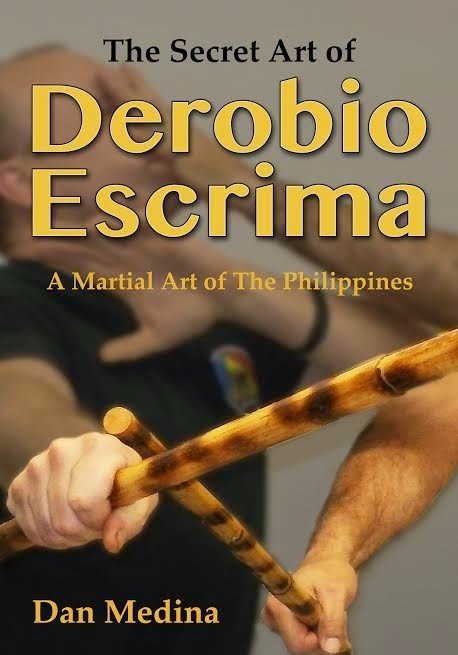 We will be discussing his latest book, released by Tambuli Media, The Secret Art of Derobio Escrima. In The Secret Art of Derobio Escrima Grandmaster Dan Medina will take you on a journey into the lives and history of two of Leyte’s Legendary Men. One was considered to be one of the Philippines most dangerous rebels, a leader of the Pulahan Movement and later a patriot. General Faustino Ablen (aka Papa Ablen). The other was his disciple, Grandmaster Braulio Tomada Pedoy, who is not only be remembered for his kindness, physical and spiritual healing, but also for his great ability in Filipino martial arts. In this book Dan Medina sheds light into the deadliness of this bone and joint crushing art. The Secret Art of Derobio Escrima is the first look into this amazing battle tested art of Derobio Escrima. Not only does it take you through the basics of Derobio Escrima, it also gives you a glimpse into inner workings of countering. This book is written with the student in mind and will take you beyond the basics. It’s designed to walk you through the principles and theories behind striking, blocking, counter attacks and locks. Of great interest is the counter to counter movement of Derobio Escrima, which sets this art apart from other arts. It’s like the standup grappling of the Filipino martial arts with weapons. It teaches you how to move with the opponent’s force, taking and using their energy and flow against them. The stick locks which have made this system famous will make you want to jump out of your skin. Guys when you give the web site agai n, please include the L... TambuLi Media :) Salamat!